Passover Seder Steps Follow–Along Designed for Families with Toddlers to Tweens. Great Add-On to Passover Haggadah. Available from Amazon.com. WINCHESTER, Va. - March 31, 2014 - PRLog -- Just released by JewishHolidaysInABox.com, the Passover Seder Steps Follow-Along is the new game / activity / learning resource designed for families with children 3 and up to help make the Seder more interactive, more fun, more engaging for all. Each set available from amazon.com contains five gloss-coated cards and five red pawns, inviting players to move from step 1 through step 15, following the 15 steps in the Passover Haggadah. Designed to be exciting for toddlers to tweens, each step features a large number, the name of the step, its meaning (i.e., what action accompanies that step), and an iconic picture explaining it. An additional baker’s dozen of images are tucked around the board to add interest and to help spark other discussions. Parents can ask younger children to find the candles or baby Moses in a basket. For older children, parents can ask what each symbol represents. What is the pillow for? Who is that woman dancing in the desert? The Passover Seder Steps activity also provides ideas for how to use it before the Seder as a learning tool and as an art activity. Durable and reusable, the cards and pawns are packaged in a re-sealable translucent envelope for easy storage. Also available as a digital download, the Passover Seder Steps Follow-Along ( http://www.jewishholidaysinabox.com/jewish-holiday-tradit...) will be helpful to families who have celebrated Passover for years, as well as families newer to the tradition. Parents looking for an easy-to-use summary of how to prepare a Passover Seder tailored to their families will appreciate the 32-page e-guide “Celebrate Passover: How to Plan a Fun, Simple Seder,” (http://jewishholidaysinabox.com/jewish-holiday-traditions...)also from JewishHolidaysInABox. In addition to tips on all the basics and a host of creative suggestions, it offers three time-saving checklists and a Pre-Seder Family Discussion Guide to help build anticipation and understanding. Two audio MP3s accompany the e-guide package, including a Passover pronunciation tutorial. 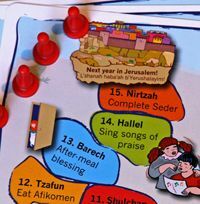 Jewish Holidays in a Box is the brainchild of marketer/teacher/writer Ellen Zimmerman who creates games, boxed kits, Hebrew blessings tutorials, and digital products to help busy parents find more joy celebrating Jewish holidays. She focuses on empowering Jewish and interfaith families to customize Passover, Hanukkah, and Shabbat home celebrations that are right for them. Ellen offers free tips through her weekly blog, "Simply Celebrating!," her Facebook page (facebook.com/JewishHolidaysInABox), and her Pinterest boards (http://www.pinterest.com/JewishHolidays).